To Wear Chanel No. 5…or not to. This weekend, I almost succumbed to a new force of fragrance. I almost bought Chanel No. 5. There it was, on the department store counter, clothed in its elegant, geometric bottle, beckoning to me, inviting me into its sensual history. Created in 1921 by Coco Chanel, this was the designer’s distillation of what she thought a woman should smell like. This was the scent loved by Marilyn Monroe, a few drops of it her only consistent bed partner during her all too short life. I picked up the bottle and sprayed its contents on my wrist. Immediately, I was greeted by the scent of bergamot and powder. A few minutes more and my skin oil changed the perfume’s configuration. Now, the watery sweet smell of lily of the valley emerged from its vortex of musk and citrus. I liked it. But, it didn’t really smell like me. Perfume, I find, is a lot like fashion. Depending on what you wear, you can change your image, change how people perceive you. Perhaps when I am in my fifties, with my white hair piled atop my head in a Victorian bun, I would be able to wear Chanel No. 5 in all its musky gravitas. But now, I am in my late twenties, with short hair and a lot of life to live. 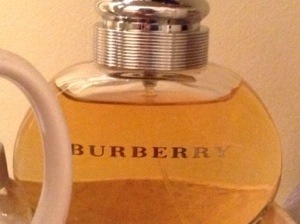 Burberry Women smelled like me, its essence distilling my own.